OUR NO. 1 COMPETITION at Second String Music is the internet. 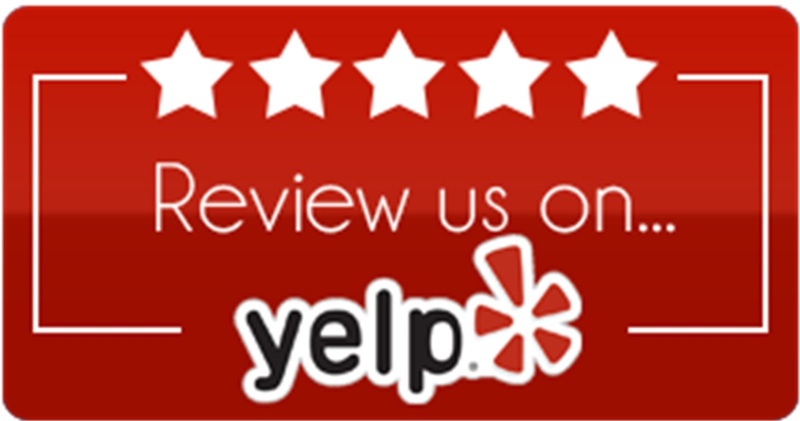 It can be hard to match online deals, so we try our best to offer unmatched service, advice and an unhurried store experience. It's been eight years and we are holding our own. Yesterday we had a frustrating experience with an online retailer. 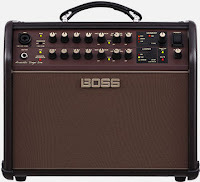 A customer came in and wanted to get a Boss Acoustic Singer amp. They are brand new. We ordered it from Roland, then were told it was out of stock until April. The customer told us about an online dealer, Sweetwater, which offered the product for $350 (not in stock till April too, though they don't tell you that). When we agree to carry a certain brand, we sign what is called a MAP agreement, where the prices are pretty much set by the dealer. MAP on this particular item is $499. Sure, we can do sales and we offer the best price possible, but this keeps bigger companies from underselling the small retailer like us. We aren't sure how Sweetwater can offer the product for that price, even though it isn't available for another month. Do they buy so many of them that they get a discount? We don't know. What we do know is that when this happens, we let our dealers know. Let's just our rep at Roland isn't happy. We'll see if Sweetwater gets into trouble or maybe has delayed delivery, who knows. In the meantime, we'll do our best to match online prices and keep the small retail experience alive and growing. Remember, if it looks too good to be true, it often is. SATURDAY IN ST. LOUIS, I'm meeting with my brother Steve. He lives in Phoenix and he's flying in so we can go to the Blues game in the afternoon and the cigar bar after (and maybe before) the game. We are staying by the airport, so I'm looking into transportation to and from downtown. There is a Metrolink, but I'm wondering how long it will take to get downtown from the airport. There are also lots of places to park downtown, but which ones are the best? Steve and I don't mind walking so we have choices. It's likely we'll park at Union Station and hoof around before and after the game. Unlike other big cities, St. Louis is relatively easy to get around and not horrendously expensive. The Blues have won 11 straight games and are starting to garner national attention. They play in Dallas Thursday night, so by the time the Big Bad Bruins roll in Saturday they could be going after 13 in a row. As I've always hated Boston from my time growing up in Montreal, it will be easy to root for the home team. Let's Go Blues! Blues fans are loyal, passionate and love their team through thick and thin. Well ... most of them, anyway. Some of the Twitter comments right now are classic. We are going to win the Cup! We are the best! Get the victory parade ready! Winning 11 in a row is impressive, but this is February, not April. Still, the game will have a playoff atmosphere and it will be a blast to soak it all in. The Hart boys are ready! THREE DAYS AFTER another epic store party, we are starting to recover. Sheryl and I had a blast and our eighth anniversary was a roaring success. 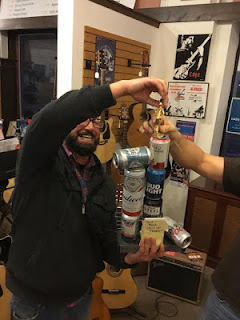 We had a big day in the store, and a jam session interrupted only by Frank Haxel somehow winning the Bedford Memorial Beer Can Bowling Invitational for the second time. Many thanks to all who came by and hung out, like Travis Hoffman, who arrived around noon and jammed almost to the end. I'm going to leave somebody out, but Jim Puskar and Jim Percy were there early too, and when Paul Lester showed up with his magic mandolin we really got going. Rick Emery showed up, saw what was happening, then went back to his car to say farewell to his wife and dog, and he and Adam Yates fired up the keyboards. Cori Lyssy got her pipes warmed up and belted out the tunes. Patrick Ballard, brother of local audiologist Kevin Ballard, arrived to do some picking. Literally. Patrick is a judge who lives in Alabama and is a flamenco guitar player, and he gave a concert later that night at the Unitarian church. Patrick played his brother's Breedlove acoustic guitar and used his amazing fingerstyle talents, and there were few times when I was playing that I got lost just staring at his fingers on his strum hand. Cheeseburger drummer Kirk Gribler and his lovely wife Susan arrived with a batch of chili and the fixins. There wasn't any left at the end of the night. Everybody loved it, everybody. The Pleasant brothers showed up to try out a microphone and ended up playing on a couple of songs. Can't say I've ever played a Backstreet Boys tune at one of our jam sessions, but we have now. They blew the roof off the store party and it wasn't even 3 p.m. yet. Geesh! I also really enjoyed our new friend Vicky, who recently bought a Luna guitar from us and is learning how to play. She showed no fear and hung right in there, even sang on a few songs. I have always said playing with other people is the best way to learn. She even figured out how to cheat on the dreaded F and B chords. See? Learning is fun! In the afternoon, Pete Magliocco and Ted Holt showed up. They haven't played much since Ted and Libby brought a new bundle of joy home a few months ago, and it was great to hear them again. Lincoln Smith and Isaac Lester jumped in to play along too, bringing back memories of the "Uninvited Cajon" incident from two years ago. This one worked out better! Finally, Blake Gardner and Zac Bentley came by, bringing back memories of The Funions (Zac filled in on bass for a few memorable gigs) and I think they had just as much fun playing with Cori Lyssy as they normally do at Blake's shows. Again, if I'm forgetting somebody, my apologies. So much fun! Sheryl and I again thank everybody for a great eight years and we'll try our best to make No. 9 the best one yet. WE'LL BE MAKING a lot of noise at our eighth anniversary party a week from Saturday. We plan on a jam session in the store and they are always a blast. 1. Bring Your Own: Sure, you might just be stopping by and want to sit in on a few songs, and then it's fine to grab a guitar and jump right in. But taking a new Second String Music guitar off the stand is ... well, we usually have to polish out scratch marks afterwards. If you know you are going to play, why not bring your own guitar? 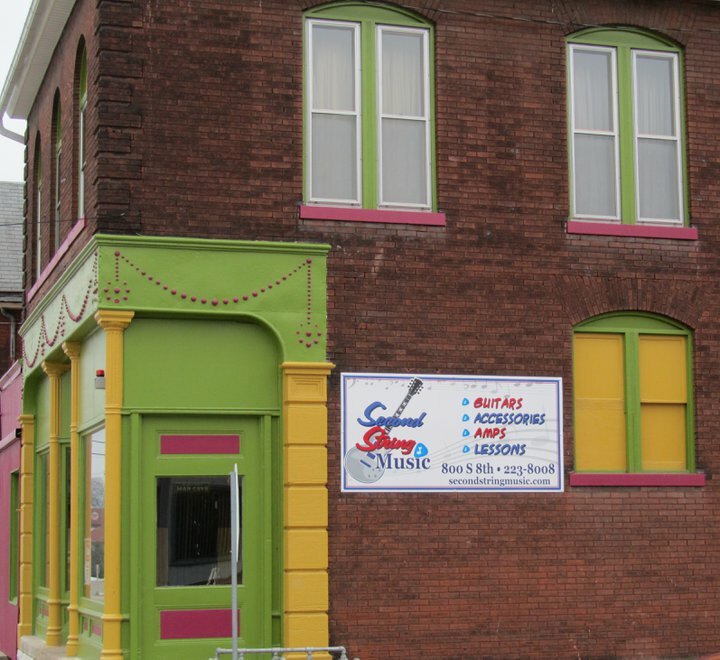 We get the argument that "you are a guitar store so you should let people just play your guitars." True. That happens, and we are fine with it. But we also sell guitars, most are brand new guitars, guitars that have been played a few times but aren't all dinged up. You can't sell a car as brand new if it's been driven a bunch of times. 2. It's Acoustic: We prefer jam sessions without plugging in. It just makes everything easier. Guitar-wise, it's hard to go electric because of cords and volume. 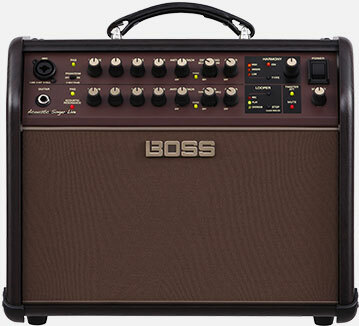 We do have some small bass amps that are perfect for jamming the four string. Jim Percy always brings a fun assortment of percussion stuff to bang on, and it's never too loud. 3. It's For Everybody: Usually there are one or two people who lead the jam session, but if you have a song you want to do, do it! There are all kinds of skill levels and if you just want to strum along a chord at a time, rock on. I encourage all my guitar students to attend and play along because it's a great way to learn and get better. Or just sit and watch. Or just sing along. There are no grades or judges. 4. The Right Songs: It's probably not a good idea to play Bohemian Rhapsody or Carry On My Wayward Son or Close To The Edge or the entire Tommy rock opera. The easier the better, "Three chords and the truth," as Dylan allegedly said. We like all kinds of music, from rock to country to pop to whatever it is kids listen to these days. Good lord, I sound like my parents. 5. Have A Good Time: It's supposed to be fun. Don't worry about what other people think. Just close your eyes, dive in and do it! EIGHT YEARS AGO today, Feb. 1 2011, it started to snow. It didn't stop for a long time. By the time it was done, we had about 2 feet of the white stuff on the ground, and it paralyzed Quincy and the surrounding area for four or five days. I was working at the Whig and Illinois State Police Trooper Mike Kindhart took me out on I-72 the day after. It was sunny and cold and the highway was still a snow-packed mess. It looked like a combat zone .... cars and truck off the road everywhere. There was a massive semi in the woods on the exit to Marblehead, and it probably took a good week or more to pull everybody out of ditches and medians. 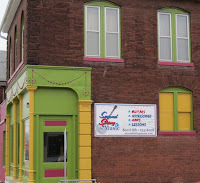 Right around this time was when Sheryl and I were planning to open Second String Music at Eighth and Washington. Sheryl would plow her way down the sidewalk to the store every morning with our border collie, Lucy. It's gonna be 50-plus degrees Sunday. Might have to have a stogie and think about it.